Aside from the opportunist raiders of store cupboards such as ants, mice and cockroaches, who are more than ready to sneak a meal when the chance comes their way, for a range of more specialist pest this is a way of life. This group, referred to as “stored product insects” by pest controllers, includes a variety of beetles, mites and moths, most of which happily live on a wide selection of foodstuffs – though some, such as the aptly named grain weevil, are more picky. Infesting both raw and processed materials, their effects range from minor nuisance to causing considerable economic loss, depending on the particular kind of insect involved. Many of these pests are chiefly a problem of warehouses and commercial food stores, but some kinds do find their way into domestic store cupboards. The biscuit beetle, grain weevil, flour beetles, grain beetles and larder beetles are probably the most commonly encountered in homes. Common throughout the UK, the biscuit beetle is part of the same family as the Furniture Beetle – which is better known as “woodworm” – and like its relative it can chew through fairly hard materials. A small 3mm long red-brown beetle, it consumes a wide diet including flour, biscuits, cake mixes, soup powder, cereals and spices. The females lay their eggs around suitable food and the larvae which hatch feed voraciously for some months before making cocoons and pupating. The new generation of adults emerging in around a fortnight, to mate and begin the process anew. This beetle is thought to be the reason for the habit of sailors in the days of wooden sailing ships knocking their biscuits before eating them, to shake out loose insects and larvae. Weevils are instantly recognisable by their elongated snouts – technically known as the “rostrum” – and the grain weevil is widely accepted as the most common pest of stored grain. As an adult it is around 2–3mm in length with a black-brown body and though it cannot fly, it is a tireless walker. The larvae are secretive and usually remain hidden within grain where they eventually pupate. There are three common sorts of grain beetle – the merchant, saw-toothed and flat – which feed on cereals, dried fruit, nuts and even chocolate. The adults are reddish-brown and around 2.5–3mm long while the larvae are yellow or brown, with dark heads. Larder beetles are relatively large store cupboard pests, being around 10mm in length and feed on a variety of animal products including cheese. The adults are black while the fast moving larvae are brown and hairy. Flour beetles – sometimes known as “bran bugs” – are a pest of milled grain products, such as flour and cereals, adults and larvae alike feeding on cereal dust and broken grains. They have the dubious honour of being the most common and destructive pest in British flour mills. 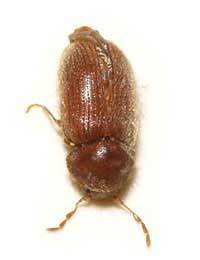 In the home, the same methods of control can be used to deal with infestations of all of these pests. The first step is to place any contaminated foods or packets into a securely sealed plastic bag which is then put out into an outside dustbin and any remaining insects dealt with using an insecticide which is approved as safe for use in food preparation areas. Although most should be already in the bin inside the discarded food packaging, some adults, larvae or eggs may still be hiding in cracks and crevices. With the cupboards emptied, treat with a suitable residual insecticide, ensuring that you get one which is safe to use around food – it will say so on the label – and follow the instructions very carefully, especially regarding how soon the cupboards can be used again. When you do re-stock, try to store likely items in jars or sealed containers to stop any stragglers from getting a meal. There are, of course, many more species of store cupboard pest, some with very odd dietary preferences and lifecycles to match – the cigarette beetle, tobacco moth, flour mite, rice weevil, spider beetle and warehouse moth, to name but a few. Fortunately, such exotic sounding beasts rarely trouble the average UK household, while the kinds that do can often be dealt with fairly successfully. A combination of removing the immediate cause, treating with appropriate insecticides and good housekeeping usually sees the back of these pests, but if the infestation is a serious or persistent one, professional help should be sought. I need help in identifying a mould, or fungus that has appeared in our kitchen.It seems to have come from some cheep dog chews, they developed a powdery feel so I threw them out, but we now have these little white spots multiplying over services on the side of the kitchen the treats were kept.Though we have cleaned all surfaces with a bleach cleaner these white spots keep reappearing! Really don't know what this is or what to do about it. Can you help?